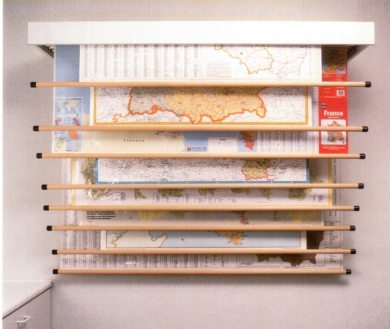 The map roller box is a system, manufactured in melamine in which the laminated roller maps are mounted IN SEQUENCE. You can choose for a roller system with 4, 6 or 8 maps. Maps, front/reverse laminated are mounted on rollers. The maximum width for the map is 141 cm. The maximum height is limited to 180 cm.